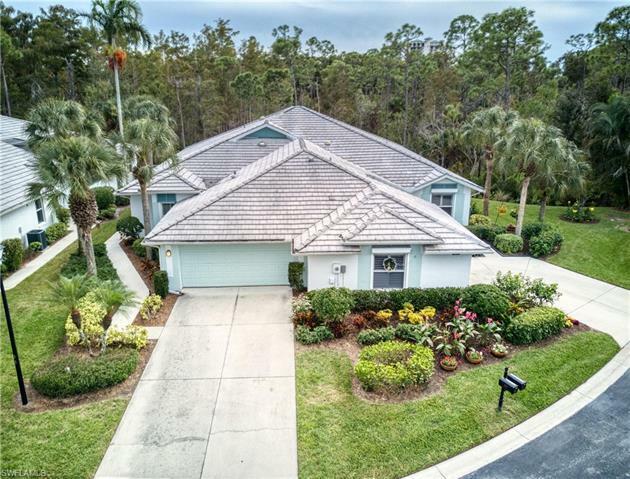 Highly Desirable North Naples location in the heart of Wiggins Pass in a Great Gated Community with low HOA fees. This 3 bedroom, 2 bath home with many great features including a spacious 2 car garage, has a wonderful split floor plan. The huge great room with high ceilings and sliding doors open to the lanai creating the sense of even more space by bringing the outside inside. The master suite features walk in closets and a large walk in shower. Simply beautiful and serene setting overlooking to the preserve from your extended lanai. Walking distance to shops, restaurants and a number of private beach and yacht clubs, while still evoking a privacy that is unlike most. Tarpon Cove Yacht and Racquet Club membership is available for a transfer fee. This membership has much to offer including dining, boat tours, tiki bar, resort style pool, marina, boat slips for lease, beach access, tennis courts and much more. Take advantage of the membership at Tarpon Cove Yacht & Racquet Club. Experience the entertaining boat shuttle to the beach, waterfront dining, club pool w/ chickee bar, tennis & fitness center!